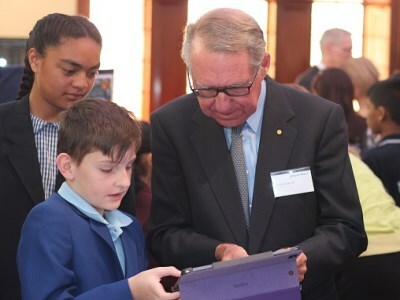 Speaking at the NSW State Library on Friday, businessman and philanthropist, David Gonski, announced a new initiative he hopes will make a meaningful difference to helping disadvantaged schools across Australia. Gonski, who sits on more than 40 boards, holds prominent positions including the independent non-executive chairman of Coca-Cola Amatil, ASX Limited and Investec Bank (Australia) Limited. He is also a Senior Adviser to Morgan Stanley Australia Limited. Unveiling The Pioneers in Philanthropy initiative, Gonski said business leaders will donate $5.25m over five years to Australian Schools Plus, an organisation which helps connect donors with schools in need to improve student outcomes. Schools Plus will then distribute the money to disadvantaged schools that apply for the funds. The Pioneers include the group’s chair, David Gonski, as well as and his wife, Orli Wargon, John B Fairfax, Kerry Stokes and the CBA, represented by its CEO, Ian Narev. Announcing the initiative, Gonski sought to dispel any misconceptions that it was “a way of indicating that government doesn't give enough to schools”. “I want to categorically deny and say to you this is entirely wrong,” he said, adding that his own review recommended philanthropy be factored into a new funding approach. In an interview with The Educator, Gonski said the Pioneers each acknowledge the greatness of teaching and are doing their part to help alleviate educational disadvantage. “I think that it’s a wonderful thing that people like the Pioneers are investing in the long-term, because what we’re doing is assisting schools to look after the next generation,” he said. Gonski echoed an earlier call he made in May at the Competitive Advantage Forum in Sydney, in which he said “long-termism is very important for this country”. “That next generation is vital in the longer-term to Australia. It is a long-term decision that each of the philanthropists, who are part of the pioneers, have made – because there won’t necessarily be a result in five minutes, but there will hopefully be a wonderful dividend for Australia in the years to come,” he said. Gonski said that an advantage of philanthropy over general state or federal funding is that it could be on a case-by-case basis. He points out that the initiative has value for principals of struggling schools, as philanthropists could answer their request for teaching and learning resources. “Governments cannot favour one school over another, but a philanthropist can. For example, if a principal says ‘I need something over and above any moneys they get’, a philanthropist can make it happen,” he explained. “The difference that such a thing as this can make is simply amazing”. Gonski added that in some other countries, donations to schools are encouraged through incentives like tax deductions, but that Australia has not had such a structure in place – until now. “In our particular structure, until this happened, it was hard to give to schools unless it went to a scholarship fund, or into a building,” he said. One of the outcomes of the Gonski Review into school funding about which Gonski said he was most pleased was the creation of Schools Plus – a charity that was established in 2013 to break down the barriers that prevented schools, particularly in disadvantaged communities – from connecting with the people and organisations that want to support them. He said a significant difference could be made by giving to organisations like Schools Plus, which he said “will bring a rigour to putting it together” with other funds and “making sure that it has an effect”. “What Schools Plus allows one to do is to get the tax deduction, the endorsement as well as at the same time giving schools that perhaps don’t have fundraisers and people who know who to call on are on tap,” he said.